UNESCO recommends postponing protection status of diminishing small porpoise population. GULF OF CALIFORNIA — A vanishing species mostly found in protected waters apparently won’t earn an “In-Danger” designation from an international agency, potentially allowing the endangered marine mammal to become extinct within the next three years or sooner. A joint recommendation by UNESCO World Heritage Center and the International Union for Conservation of Nature (IUCN) stated consideration of the vaquita porpoise earning “In-Danger” status would be put on hold. UNESCO, its World Heritage Committee and IUCN could revisit the “In-Danger” designation for vaquitas in 2019. The question is certainly begged: Are we doing all we can to save the marine mammal from extinction? What more can be done if we are not? Fingers are certainly (and consistently) being pointed at the United States, Mexico and (now) UNESCO/IUCN for the dire circumstances surrounding the vaquita porpoise. Fewer than 30 vaquita porpoises exist in the world, according to a report published by the International Committee for the Recovery of the Vaquita. Another report presented to the National Oceanic and Atmospheric Administration’s (NOAA) Southwest Fisheries Science Center in La Jolla added the vaquita porpoise population has declined by an average of 34 percent, annually, between 2011 and 2015. CBD staff blamed Mexico Pres. Enrique Peña Nieto for failing to protect the vaquita population, which are mostly found in protected waters of the Gulf of California, from extinction. U.S. Pres. Donald J. Trump was also sued by CBD, Animal Welfare Institute and the Natural Resources Defense Council (NRDC) in December 2017 for failure to enforce international agreements protecting vaquitas from incidental entanglements and drownings. The lawsuit stated the vaquita population could be extinct by 2019 – about two years earlier than mentioned in a press release published by CBD in late May. “While the vaquita inhabits Mexico, its fate is closely tied to actions taken and withheld in the United States by both consumers and the U.S. government. Consumers have contributed to the vaquita’s precipitous decline by unwittingly demanding, purchasing, and consuming seafood products from the Upper Gulf of California caught by fishermen using vaquita-harmful gillnets,” the joint lawsuit stated. “The U.S. government has contributed to the vaquita’s decline by failing to keep such seafood out of the market as required by law. “The United States has long had both the authority and the mandate to ensure that foreign nations that export seafood to the United States meet the same strong marine mammal protection standards that apply to U.S. fishermen,” the lawsuit continued. Let’s first try to figure out the UNESCO/IUCN position. UNESCO’s World Heritage Committee stated it has “utmost concern” about the vaquita’s current population status. Some reports state there are fewer than 30 vaquita remaining; at least one estimate indicates only 12 vaquita remain. Committee members added they welcome efforts to strengthen surveillance of the vaquita population, enact a permanent gillnet ban, increase net retrieval operations and enforce regional and international regulations. An exhaustive search for the recommendation on UNESCO’s website revealed a draft decision with several actions proposed by the World Heritage Committee to address the diminishing vaquita population, which are mostly found in the Gulf of California in northwestern Mexico. “[The World Heritage Committee] expresses its concern that insufficient progress has been made on the development and introduction of multiple and viable alternative fishing gears that do not endanger vaquita and other non-target marine mammals, sharks and turtles [and] regrets that the Vaquita Conservation, Protection and Recovery programme (CPR), set-up to establish a small captive population in order to avoid extinction of the species, had to be abandoned after one of the captured animals died,” the draft decision stated. “Removing vaquita to a temporary sanctuary is not a viable option and … the only way to safeguard the species from extinction is therefore the cessation of illegal fishing activities within its habitat,” the draft decision continued. The April 2018 issue of World Heritage magazine, which is published by UNESCO, said the attempt to save the vaquita is “a story of (failed) conservation. Efforts to conserve or protect the Upper Gulf of California, where vaquitas are common, have been in effect since 1993. 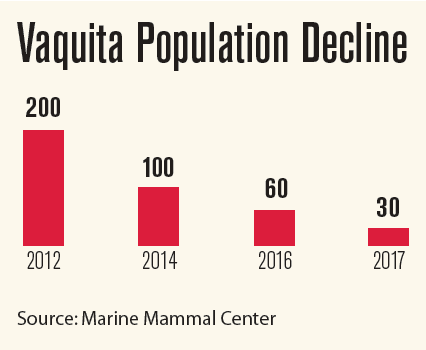 “The vaquita population declined 90 percent between 2011 and 2016, leaving the population at an estimated 30 individuals,” the magazine’s feature story on vaquitas stated. “As we continue to witness this decline and legal fishing activities are suspended, the government struggles to control totoaba poaching and its illegal trade. “A weak governance system, where legal frameworks are not reinforced with the necessary legal, human and economic resources, is unable to support conservation efforts on the ground, exacerbating the environmental and social challenges,” the article, authored by UC Riverside Gulf of California Marine Program Director Catalina López-Sagástegui, said. The Islands and Protected Areas of the Gulf of California became a World Heritage site in 2005. The area was designated as a World Heritage site in an effort to protect the vaquita. CBD staff estimate the vaquita loses nearly half of each population each year due to fishing gear entanglement. Those who are monitoring the plight of the vaquita blame illegal fishing activities as the reason why the marine mammal is almost extinct. 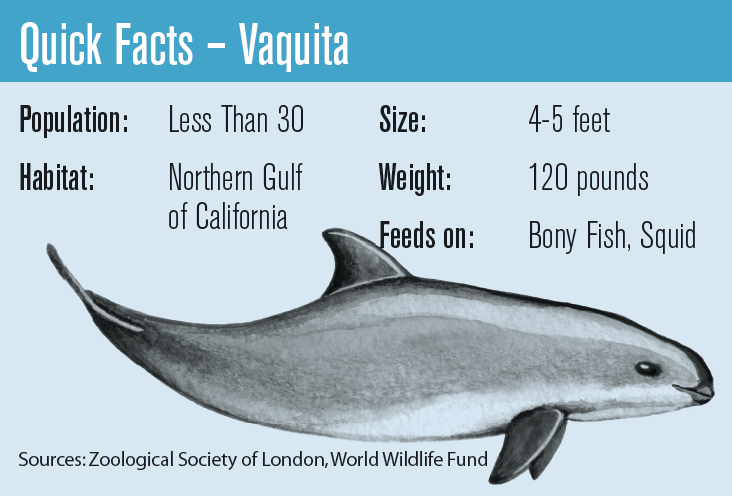 “The vaquita is the world’s smallest porpoise and can only be found in the Gulf of California. It is a victim of by-catch from illegal fishing of another Critically Endangered species, the totoaba, whose swim bladder fetches high prices in Asian markets,” a July 6, 2017 article published by IUCN stated. An IUCN report on the vaquita presented at the Southwest Fisheries Center in La Jolla, Dec. 11-12, 2017, stated there has been a continued effort to find and remove abandoned or illegal fishing gear. IUCN officials recommended the Mexican government ramp up enforcement of illegal fishing activities and continue removal of gillnets from the vaquita habitat. “The Government of Mexico [should] prohibit all fishing and navigation [within the exclusion zone], increase enforcement presence to a level which is able to respond to any report of illegal activities within 30 minutes, increase and focus net removal efforts are within in the exclusion zone [and] negotiate the appropriate transit corridors to allow legal fishing to continue outside the exclusion zone,” IUCN officials stated in their 2017 report. They also recommended using drones to monitor for possible vaquita entanglement. The IUCN report presented last December acknowledged the status of the marine mammal is dire … and worsening. 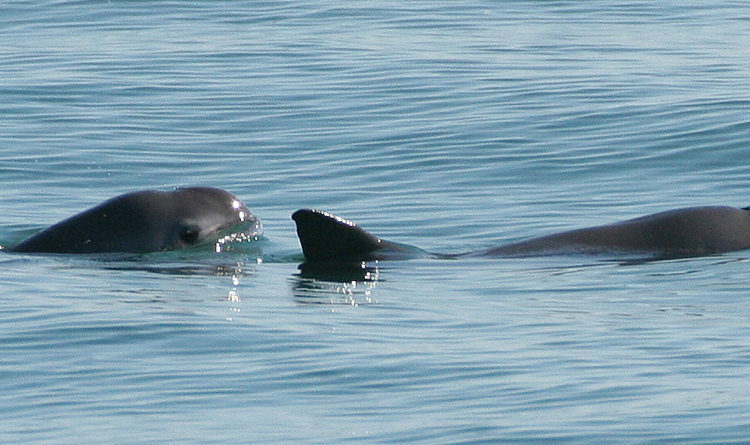 “As of November 2016, only approximately 30 vaquitas likely remained. Analysis of the 2017 Acoustic Monitoring Program data showed that the decline has continued unabated. Thus, the already desperate situation has worsened, despite existing conservation measures and current enforcement efforts,” the IUCN report stated. The report added the vaquita monitoring program must continue in order to determine the best and most effective conservation measures. What happens, though, if the monitoring program does not yield an effective conservation measure before the vaquita population disappears entirely? UNESCO’s World Heritage Committee will vote on the draft decision at a June 24 meeting in Manama, Bahrain. The question is whether conservation measures are enacted while there are still vaquita left to save. CBD staff stated the application of an “In-Danger” designation to the vaquita population could expedite efforts to address illegal fishing within the marine mammal’s habitat. “An ‘In-Danger’ listing would help raise attention to the plight of the vaquita and lend both logistical and financial support to Mexico to eradicate illegal fishing in the vaquita’s habitat,” CBD staff stated in a recently released statement. The World Heritage Committee and IUCN, in April 2017, actually recommended and “In-Danger” designation for the protected areas in the Gulf of California. “The Mexican government lobbied to postpone the decision until 2018, based on commitments and promises that it failed to uphold,” CBD staff alleged. CBD’s Mexico representative said any delay in safeguarding the remaining vaquita population essentially functions as a death sentence for the marine mammal. He specifically urged UNESCO to force Peña Nieto to act immediately, lest suffer the consequences of the vaquita population vanishing entirely within the next three years. Various agencies, countries, NGOs and nonprofits have studied the vaquita porpoise’s population since the 1990s. Has bureaucracy/the lack of enforcement come in the way of saving the marine mammal from extinction? A reactive monitoring mission headed by IUCN and the World Heritage Committee in 2017 developed several recommendations to be implemented. Multiagency enforcement of illegal fishing activities. Efforts to maintain the small captive population of vaquitas “ had to be abandoned after one of the captured animals died,” according to the World Heritage Committee’s draft decision. Progress has reportedly been made on some of the priority recommendations, but the World Heritage Committee wants more time to determine whether implementation of the recommendations are actually working. “It is too early to determine how effectively the efforts … to implement the 2017 recommendations have averted the risk of extinction of the vaquita and it is therefore recommended that the [World Heritage] Committee postpone a decision on the possible inscription of the property on the List of World Heritage in Danger to its 43rd session in 2019, when more data from the 2018-2019 season when illegal totoaba fishing occurs are available,” the draft decision stated. It remains to be seen whether an “In-Danger” status would protect the vaquita population from extinction, or whether the strict enforcement of illegal fishing activities would be enough to save the handful of marine mammals still swimming in our waters. Active enforcement against illegal fishing activities, just the same, should not cease in the event that efforts to save the vaquita aren’t successful. Kari Birdseye, Natural Resources Defense Council, 415-875-8243, kbirdseye@nrdc.org. The Vaquita are doomed, The Colorado river brought nutrients to the Sea of Cortez for thousands of years. It no longer does. Plankton, small fish and shrimp numbers have been slowly diminishing since the dams were built. Not a drop of the Colorado water flows to the sea. The Sea of Cortez has been dying a slow death ever since. Even stopping the gill netting now will not bring back the Vaquita. Humans have taken their toll on these small porpoise, it’s very sad!